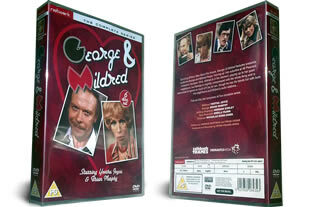 George and Mildred DVD Set, containing every episode made of the 5 series on 6 dvd's. The complete collection, DELIVERED FREE IN THE UK when you spend over £15. Or £2.99 P+P. George and Mildred was a spin off made by Thames television of Man About the House. The series starts with George and Mildred Roper moving from their flat in Man about the House, to a new nice house in a new housing estate. The classic sitcom follows their new life.